Animals and counting. That about sums up my boys' interests these days. So when our Poppins Book Nook theme for February was Ponds & Lakes, I knew I had to find something that included both animals and counting to get them excited. Throw in a bit of glitter and water magic and we had a winner of an activity that we all loved! We've made a few fun discovery bottles lately and the boys are really enjoying them, so I decided we'd make another for this month's book activity. 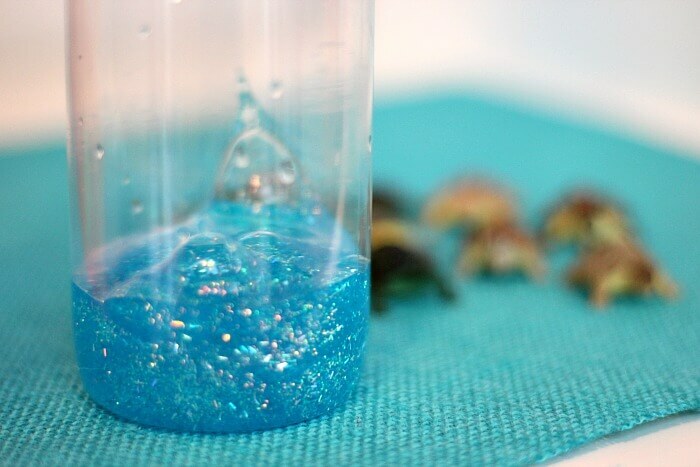 Our glittery St. Patrick's Day bottle was a big hit, so I thought we needed another sparkly activity too. 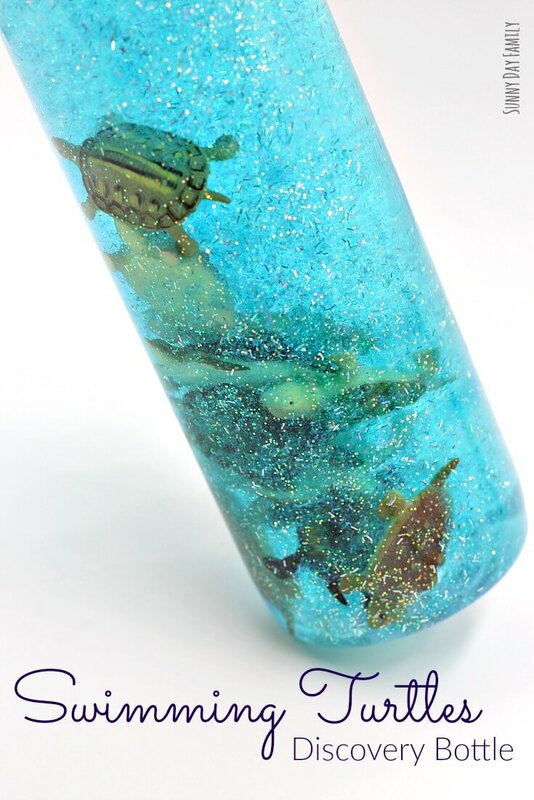 This swimming turtle bottle hit all the marks - animals, counting practice, and glitter! It's a super fun activity and a companion to a wonderful book. 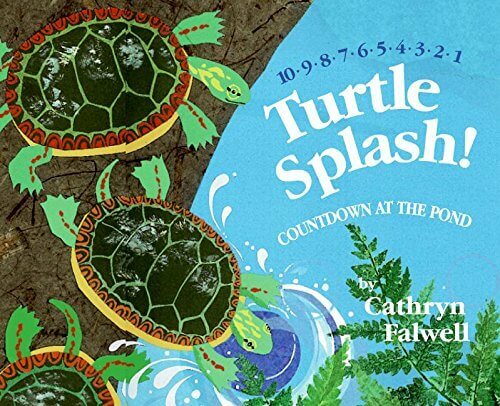 We started with this adorable counting book, Turtle Splash: Countdown at the Pond by Cathryn Falwell. Turtle Splash follows 10 turtles who are trying to rest, but keep getting interrupted by the other animals at the pond. One by one we count along as the turtles splash into the pond and finally relax for the night. 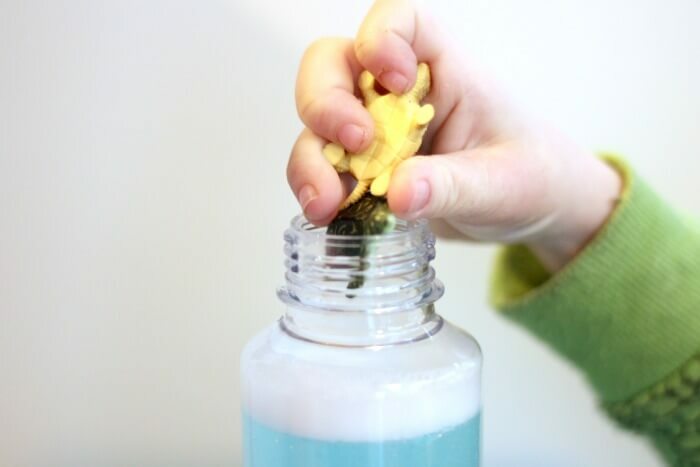 Our Swimming Turtle bottle is the perfect companion to this fun counting book as you can make your very own "pond" for 10 tiny turtles to swim and rest in! Clean, empty water bottle or jar. I use VOSS bottles for their smooth sides and wide mouth. Find them here or pick one up at a grocery or convenience store. 10 small turtle toys - I used these. 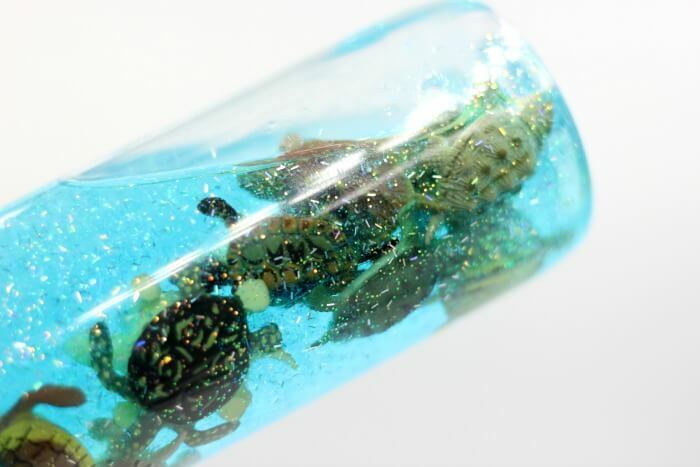 Place the glitter glue in the bottle. I used about 3/4 of a bottle for a medium sized water bottle. You can always add more if you need it. Then fill the bottle with warm water (make sure it's warm to help mix with the glue). Leave about 1/2" of space at the top. Close the bottle and mix together well. Then add your turtles! This part was super fun for my boys and is great to do as you read Turtle Splash - count down as each one goes in. Once all your turtles are in the bottle, close tightly. You may want to glue the top on if you are concerned about your children attempting to open it. Now you have 10 turtles ready to swim in their very own "pond". 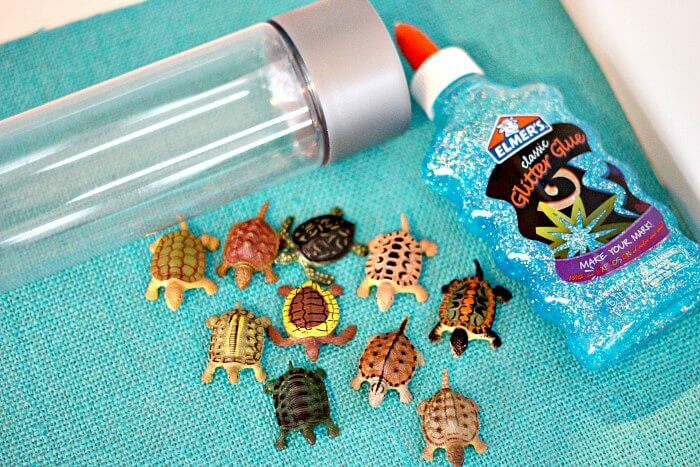 Your children will love to move and turn the bottle to see the turtles swimming from top to bottom. So fun! 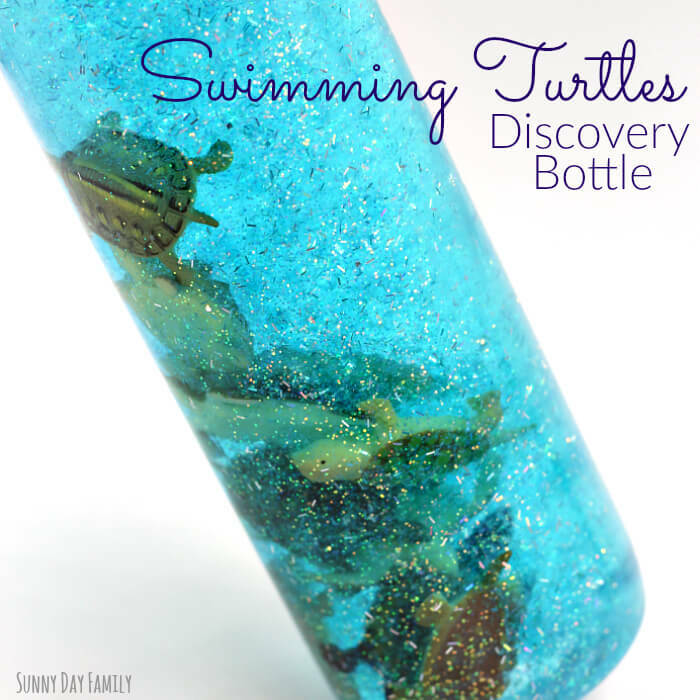 We really enjoyed making and playing with our Swimming Turtles bottle. It's the perfect companion to Turtle Splash and a fun counting activity. 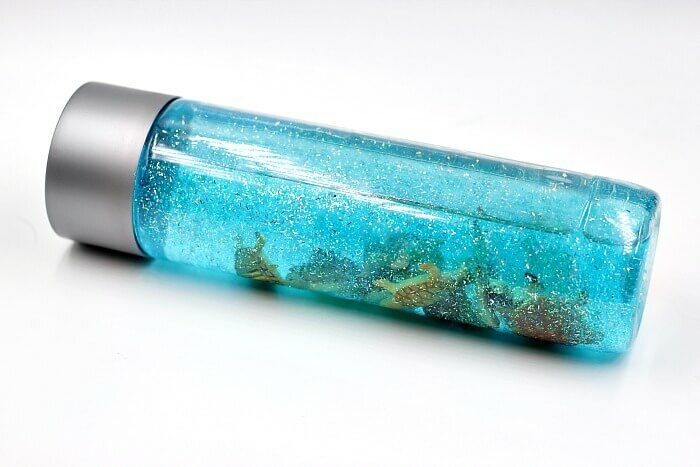 The bottle is also wonderful for calming and quiet time, as the glittery water is very soothing to watch. We love it! What fun! So happy to see this cute project that connects to my book!